Walkerville, Ontario, 17.12.1904, 40 Shares á US-$ 100, #22, 21 x 25,6 cm, schwarz, weiß, rot, Knickfalten, Erhaltung VF, OU, Original-Signatur des Chefs von Ford Canada John S. Gray. Das Stück stammt aus dem Gründungsjahr der Gesellschaft! Walkerville, Ontario, 17 December 1904, 40 Shares á US-$ 100, #22, 21 x 25.6 cm, black, white, red, folds, condition VF, OU, original signature of the Canadian Ford President John S. Gray. The certificate was issued in the year of the foundation of the company. Nur ein Jahr nach seiner ersten US-Fabrik gründete Henry Ford 1904 die kanadische Gesellschaft. Auf diese Weise wollte er Zölle sparen und vom niedrigen kanadischen Lohnniveau profitieren. Von Kanada aus wurde England und der Rest des Commonwealth mit Fahrzeugen versorgt. Ford war immer eine der größten Firmen in Kanada. In den 1970er Jahren war die Gesellschaft zeitweise sogar das größte Unternehmen des Landes. John Simpson Gray wurde 1841 in Edinburgh, Schottland geboren. 1849 wanderte seine Familie in die USA aus und ließ sich auf einer Farm in Wisconsin nieder. Zusammen mit Partnern gründete er eine Süßigkeitenfirma. Diese veräußerte er 1903 an die National Candy Company. Im gleichen Jahr erwarb er 10,5 Prozent an der neu gegründeten Ford Motor Company, deren President er wurde. Henry Ford war Vice-President! Gray verstarb 1906.
was to save customs this way and to participate in the lower Canadian wages. The Canadian company supplied the United Kingdom and the Commonwealth with cars. 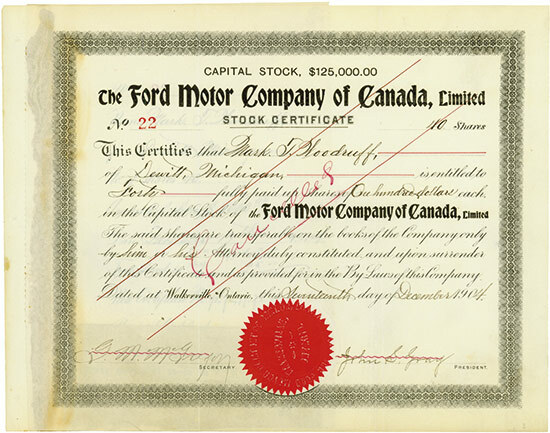 Ford was always one of the largest Canadian companies. It was even the largest Canadian company in the 1970th. John Simpson Gray was born in Edinburg, Scotland in 1841. He emigrated with his family to the USA and started a farm in Wisconsin in 1849. Together with partners Gray incorporated a candy company. This company was sold to the National Candy Company in 1903 and bought 10.5 per cent of the newly incorporated Ford Motor Company. Gray became the first president of the company, Henry Ford was Vice-President. Gray died in 1906.